Writers On The Move: What is Your Favorite Reference Book? I rely on my old favorites, The Little, Brown Compact Handbook, Self-Editing for fiction Writers by Renni Browne and Dave King and the Flip Dictionary (better than a thesaurus sometimes). But I’m always preaching “feelings” to my students and editing clients. What is he feeling here? What is her reaction to this? How does sad (happy, angry, frustrated) feel? I sometimes have to stop my own writing and think about how to describe a feeling in a way that’s not over-used, trite or clichéd. You can only have your character’s stomach clench a time or two before your reader begins to suspect he or she has an ulcer. 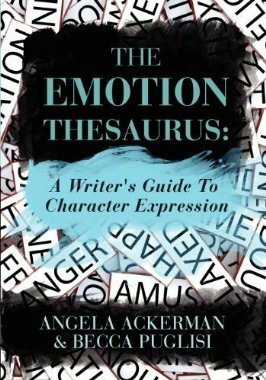 So, recently I downloaded The Emotion Thesaurus: A Writers Guide to Character Expression by Angela Ackerman and Becca Puglisi. Angela and Becca host The Bookshelf Muse, an award-winning online resource for writers that offers a number of different thesauri to aid authors in their descriptive writing efforts. • Cues of acute or long term anger: skin problems, ulcers, etc. I keep this handy reference on my Kindle for PC so it’s always right there when I get stuck. A native Montanan, Heidi M. Thomas now lives in Northwest Arizona. Her first novel, Cowgirl Dreams, is based on her grandmother, and the sequel, Follow the Dream, has recently won the national WILLA Award. Heidi has a degree in journalism, a certificate in fiction writing, and is a member of Northwest Independent Editors Guild. She teaches writing, and edits, blogs, and is working on the next books in her “Dare to Dream” series. Sounds like a great resource for us writers. Thanks for sharing! Angela and Becca's book is a great aid for writers. Hugely popular too. Great advice, Heidi. I bought this book and agree, it's terrific. Every year I buy the Institute for Children's Literature writer's guidebook and read it cover to cover, always a big help. Heidi, I have this book also, and it's been an absolute lifesaver. I can't say enough good things about this small volume.